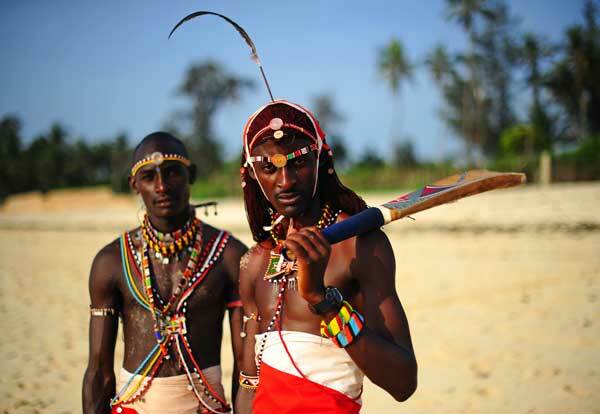 CRICKET: Standing in front of the wicket, Kenyan cricketer and Maasai warrior Francis Meshame sports his traditional headdress and red robes, but has swapped his shield and spear for protective pads and a cricket bat. “It is an easy game because when you bowl it is just like throwing the spear,” said Meshame, part of a team of cricketers from Kenya’s famous Maasai tribe who have embraced the game but not the sport’s traditional whites. “The pads we use are just like the shields we use when we are fighting, and the bat itself is just like the ‘rungu,’ the clubs that we use,” the 29-year-old batsman added. Cricket, imported into Kenya during British colonial rule, is played only in the east African country’s largest cities. None of the Maasai on this team had even heard of the sport until five years ago when Aliya Bauer, a South African cricket fan, began introducing local schoolchildren in the village of Ol Polei to the game. Based in Kenya’s remote central highlands of Laikipia, they have travelled to the Indian Ocean port of Mombasa for this match. Bauer, now 34, has spent more than seven years in Kenya. Before starting work on a project studying primates in Laikipia, she was an international cricket scorer in her native South Africa. Watching the schoolchildren play in Ol Polei, “the older boys who were passing by began to get interested,” she says. One of the team’s some 20 players, Ole Sonyanga Weblen Ngais, 23, recalls being intrigued by this “very strange game”. “Teaching people a new sport they have never seen is quite challenging,” Bauer admitted, saying progress was also hampered by a lack of facilities and equipment. Thanks to donations, the team, dubbed the Maasai Cricket Warriors, is now equipped with bats, balls, gloves and pads. The Maasai took to the game like ducks to water. The “moranes (young Maasai warriors) learned to throw the spear when they were very young. It makes them very good bowlers,” Bauer says. The enthusiasm is real. One player does not hesitate to walk 16 kilometres (10 miles) to the practice field and home again. Despite limited resources, the team has come a long way since they first put bat to ball. The Maasai Cricket Warriors have staged exhibition matches at the Laikipia Highlands Games, where the tribes of the region engage in athletics, football and other events, for the past two years running. Last year trainers from Cricket Without Borders (CWB) came to Laikipia and awarded several of the team’s players their official coaching diploma. Twelve of the players have been in Mombasa since late January on a two-month training course at the Nursery of Cricket Legends, an academy opened by former national team players. They recently demonstrated their cricket skills on the sidelines of a Kenya-Ireland test match. The team also uses cricket metaphors to deliver messages within the highly traditional and patriarchal Maasai community, in which early marriage and female genital mutilation (FGM) are firmly rooted customs. They visit schools to talk about AIDS prevention, the fight against FGM, polygamy and early marriage, gender equality, environmental protection and battling alcoholism and drug addiction. Today some 20 schools in Laikipia offer introductory cricket, Bauer said proudly. By contrast, in the rest of the country cricket is far less popular than athletics, football or seven-a-side rugby, and it continues to weaken even though the national team reached the semi-finals of the 2003 World Cup. And Bauer’s Maasai Cricket Warriors, living in relative isolation, still lack the opponents – and the money – they need in order to progress. The team receives no financial assistance from the Kenyan Cricket Federation, and all its members are volunteers, including Bauer, who now works full-time as coach. The team is currently working with organisations and sponsors to raise funds to enable them to take part in a major amateur tournament in Cape Town, South Africa, later this year.